Days of Palestine, Gaza Strip –It has been ten years for the strict, harsh and inhumane Israeli, Egyptian and internationally backed blockade on the Gaza Strip. The blockade started in the wake of the 2006 Palestinian elections, which the Palestinian Islamic Resistance Movement, Hamas, won with an overwhelming majority. Local and international monitoring organisations described the Palestinian poll as one of the most transparent ever recorded. However, Palestinians remember it with sadness as the elections marked the internal political split and the start of the siege of Gaza. The Israeli occupation closed all crossings into the territory, keeping only the Erez Crossing open for occasional pedestrian traffic and Kerem Shalom for a few classified and highly-regulated goods. Erez has been used a trap for people trying to cross. Egypt has been keeping the Rafah Crossing closed for most of the time. In 2015, the crossing was only open for 21 days; just 10,000 Palestinians were allowed through, among them pilgrims, patients and students. The Israeli authorities imposed severe restrictions on patients and their companions travelling through Erez. Human rights groups have recorded the arrest of several patients or their companions while using the crossing into the occupied Palestine. Attempts are made by the Israeli occupation intelligence agents to blackmail people into becoming informers in exchange for being allowed to cross. Palestinian ministry of health in Gaza has since been reporting chronic shortages of medicines and hospital disposables. “Shelves are empty due to the restrictions imposed by the Israelis on people and goods going in and out of the coastal enclave,” MOH spokesman says. The plight of the Palestinians in Gaza has aroused widespread popular support across the world and many attempts have been made to break the siege by sea. Although a few small boats made the trip in the first few years, later and more ambitious attempts were stopped in international waters by the Israeli navy, often violently. In May, 2010, for example, the Israeli commandos intercepted the Freedom Flotilla. Nine Turkish citizens were killed in the assault and a number of others were wounded; one died in 2014 as a direct result of his wounds. The ships were towed into and Israeli port and everyone on board was arrested. During the siege, the Israeli occupation has launched four major military offensives against the people of Gaza, in 2006, 2008/9, 2012 and 2014; the latter was the most destructive. It lasted for 51 days and whole areas of Gaza were flattened by Israeli bombs; tens of thousands of people were displaced. The strict siege and wars have shattered the Palestinian economy in Gaza, economic commentator Maher al-Tabaa told Quds Press. 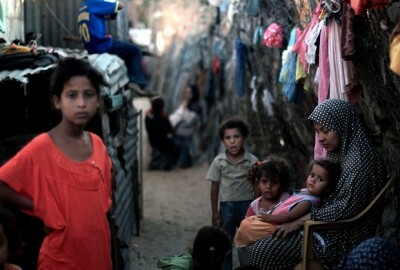 “The unemployment rate in Gaza stands at 42 per cent, with the blockade deepening the economic crisis,” he explained. According to the International Monetary Fund, the unemployment rate in Gaza is the highest in the world and there are more than 200,000 unemployed people in Gaza. Al-Tabaa warned that if the siege of Gaza continues, normal life would not be viable in the territory in 2016. Many international organisations have issued similar warnings due to the effects of the oppressive Israeli measures, which are regarded as collective punishment and are illegal in international law.